When is it OK to send your child off to the public toilet by themselves? Mum shared that she was seriously debating allowing her five year old son to go to the toilet alone. She wrote, “My five year old is fiercely independent and wants to do everything by himself. But now he is making a huge fuss every time I make him come with me to the ladies bathroom if we’re out and about. Many mums agreed that he was too young to go on his own. I must admit even as a grown adult I HATE using the public toilets. My youngest is ten and I always make him go with his dad or wait if possible. A couple of mums said just to be honest with him and let him know why it is not a good idea. Many agreed kids are not old enough until in their teens and they aware of the dangers. 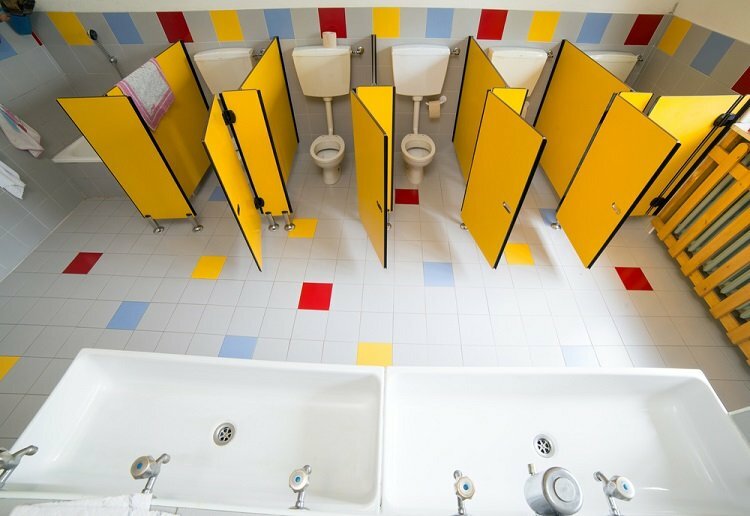 Parenting expert Jo Ryan from support service Babybliss told Daily Mail Australia the age of when a child should go into a public toilet alone is a ‘tough question’. ‘It depends on the child really,’ she said. ‘I think six is too young. I’m not sure if I’d want them to go in a public toilet on their own,’ Ryan explained. ‘Some boys want to do that at that age, you have to judge the child and whether it is a safe environment. Toilets are always an unknown. ‘For me, I don‘t think I would let them go in on their own, I would want to take them with me. It’s usually when they are a bit older -around 7 or 8 – that they want to go in alone,’ Ryan said. She recommended that parents make use of parenting rooms more often. On a cruise I asked for the toilets for a 4 y.o. boy. I was directed to the Male Toilets. There was no way I was letting him go into that toilet alone, especially while he was with me and I was responsible for him. The staff looked shocked so I explained to him the reason why, I spoke to his parents about it. They said the “recognised” age is 5 -6. His Mum still took him in the Ladies Toilet with her when they were out and about if she didn’t have either her husband or other responsible male with her. Sometimes it’s the personality and capabilities of the individual child. Plus each visit to public toilets can differ. Supervision of any child in a parents care comes into it though. Always be aware . Five is too young. I’m trying to hold out till they’re teenagers. this is yet another controversial topic – I think 5 is a little young but it definetly depends on individual circumstances. When they can adequately defend themselves really isn’t it?! I think it’s up to the parents and child in terms of confidence and independence. We allowed our son to go on his own when he was at Primary School. We were at the cafe nearby and he was given the space to do that. We had no issues and he felt safe and confident. My 8 Year old constantly asks why he has to come to ladies with me and I tell him that I have no idea who is in the mens loo and I can’t see him. In the ladies everyone is behind a closed door so it’s private. We need more parents rooms and toilets for boys only under 12. Psychologists say the up until the age of 12 children cannot be left unsupervised because they do not have the capacity to make decisions in times of danger (obviously not all kids will be but in general). If you cannot use women’s toilets, use the disabled ones, most disabled people understand why it is getting used by boys. It can be hard to decide this. My older boys have no idea when they started using the men’s room. I think by the time the older one was 6-7 he had another one with him, though did not like waiting outside hanging out near the door. Get some weird looks. A lot of yelling out to them. Yes did prefer a male relation with me. My younger son lucky we have parent rooms around now. Five or six is definitely too young. These cases are so sickening and horrific. Public toilets are unappealing for so many reasons and safety is one of the reasons why a child should not go alone – it is too young.